Nharangga people have always lived on Yorke Peninsula. Their country extends as far north as Port Broughton and east to the Hummock Ranges. Their neighbours were the Kaurna of the Adelaide Plains and the Nukunu to the north, with whom the Nharangga would meet for trade and ceremony. 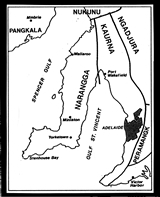 The Nharangga nation was made up of four clans, the Kurnara in the north of the peninsula, Windera in the east, Wari in the west and Dilpa in the south. through the study of the materials left by past generations of Nharangga people. The Nharangga managed and preserved their lands. They used fire to clear old grasses and promote fresh plant growth. Fresh water rock holes were covered with slabs of stone or brushwood to keep the water clean and to prevent animals from drinking from them. Track ways were maintained through the thick mallee forests, linking places and people throughout the peninsula. Ceremony played an important role in their lives. Corroborees and meetings were held to settle disagreements, for initiation, marriage, trade, or to share stories and experiences. 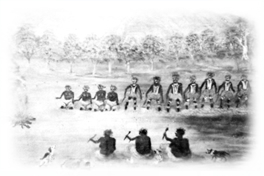 For instance, the rain corroboree, or Munga corroboree, would be sung and danced to break a drought. Large meetings would be held at various places such as Bubladowie Waterhole (Pupuldawi) and Weavers Lagoon. Clothing was made from wallaby, kangaroo and possum skins while wood and roots were used as spears, digging sticks and shields, and for constructing shelters and housing. Fishing and hunting nets were made from a reed, Buntu Buntu, which women would prepare over several days; picking it, drying it and rolling it into string. Their expertise at fishing was admired by many of the early European settlers with butterfish, salmon, mullet and snapper traded for tobacco and other supplies. A swimmer would sometimes carry a bait fish into deep water and return to shore where others would net the schools of fish that would follow, or a spotter would signal from the cliff tops as to where the schools of fish were. Shell fish were also important in the Nharangga diet. 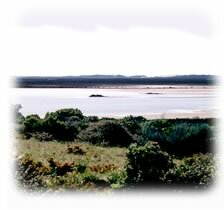 People would walk out onto the reefs at low tide to collect periwinkles and warreners or dive into deeper water for abalone. The shells would be put into string bags along with the occasional crab or crayfish and carried back to camp. The peninsula is criss crossed with stories of the dreamtime with particular locations relating to the exploits of various beings. Budera, Ngarna the powerful club thrower, Curlew the Owl, Bulgawan the wicked old woman and Madjitju the bat man were some of the beings who lived on the peninsula during the dreamtime. On a trip to Marion Bay you might come across the small mud huts of the Illawari, the little people, and see the bones of Badara lying in the middle of a salt lake. At Point Yorke you might hear the evil spirit Wainjira breaking on the rocks.